Catch these Sea World rides at Sea World San Diego California. The rides are fun and exciting for the whole family. Sea World CA is a popular theme park in southern California primarily known for its animal shows, but it also has some great rides. 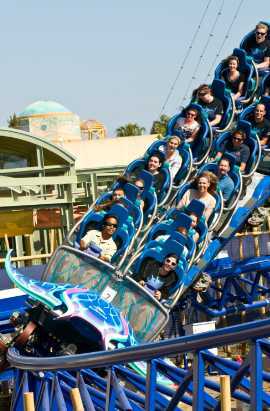 Manta – The Manta is a roller coaster ride all it’s own, one of the new Sea World rides. It is a European designed roller coaster with twists and turns for your thrill seeking pleasure. You will experience the underwater launch via the 270° multi media screen with 22 high definition projections. You will experience manta rays as never before. The ride continues with speeds up to 43 miles per hour. Wrap up the ride at the 100,000-gallon pool exhibit where you will be up close and personal with the “rays” themselves. There are as many as 60 bat rays to touch and experience. Journey to Atlantis – The thrill factor is high and the splash factor is wet so prepare for the initial 60-foot plunge that leaves you begging for more! 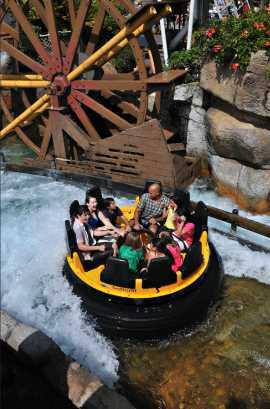 This amazing ride takes you on a visit to a lost civilization and has you “soaking” up some real fun. Skytower – Skytower offers a view of San Diego and Sea World as never seen before. On a clear day you can see as far as 100 miles away. Nothing but breathtaking views of the Pacific Ocean and Mission Bay…..as far as the eyes can see. This is the perfect starting point of your day to overlook all of Sea World San Diego CA while you decide where your next adventure will be. Shipwreck Rapids – Shipwreck Rapids is sure to bring out the castaway in all of us. This ride offers a wet and thrilling experience via a tube-style raft. Be at peace momentarily while you wind through the smooth waters just before your world is transposed to the typical uncertainties of a real river. You will whirl and twirl and splash about just before taking the plunge through a waterfall that lands you in an underground cavern. This is one of the popular Sea World rides and you may get a little wet! Wild Arctic Ride – You can leave your water poncho behind for this adventure but you may want to bring a jacket. You will soar via flight simulator over some beautiful and yet treacherous icy peaks and valleys as you make your way to the Wild Artic Base Station where you can see beluga whales, polar bears and walruses. This jet-helicopter ride will leave you wanting to make a quick stop on the way home from Sea World CA to book a vacation with your local travel agent. Seaworld San Diego offers animal interactions like swim with the dolphins, shows and other fun rides and activities for the entire family.